Hello and welcome to GetWebInfo.com. Here on this post i will tell you that how can you approve your Google AdSense account for your blogger blog or a Wordpress website. 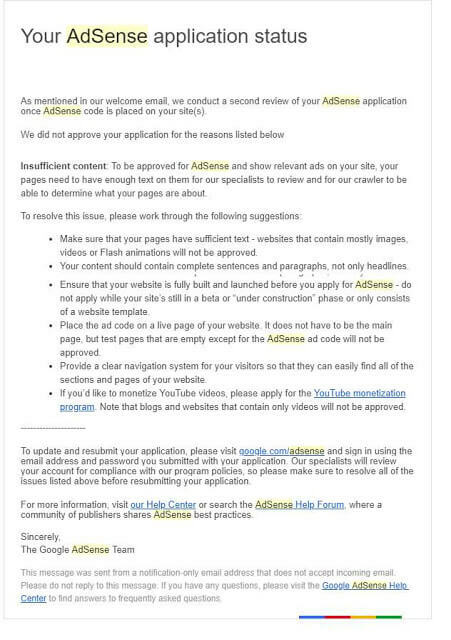 After reading this article you can be able to approve your adsense account even Google AdSense says your blog is copy right issue. This is a simple and easy way to approve your blog or website. You can not monetize the content with Adsense ads which is already monetized and owned by other. Google AdSense is completely against it and if you do that you will be lost your adsense account. I never take risk with my adsense in that case, as i always wrote my own thoughts and content. But on the web most of the website using copied content but these all sites are high authority and reputed websites and they even mention the source of content so they don't face any issue also they have premium adsense. But if you used copied then it will be same as playing with your adsense. Maybe you earn with it but there is no security as adsense team can ban your adsense at any time. It can also possible to put other websites to your own website if you put their links on your content. Most of the web portal websites doing like these in order to escape from copyright issues. Did you see the TV channels showing sports news with mentioning channel name below like "courtesy: PTV Sports". Like this you have to give links to those websites you took content and you have to mention as content source. But on this post i can tell you that you copy content from other websites and use this content to your own websites easily. It's very simple and easy step to copied content from other website and use it to your own websites that can appear like hundered percent original content. I am also apply for Google Adsense for Three times, But they do not accept my application. Because they can say that your website content is not original. They can also sent this email on to my account i have attach my email picture just below this line see it! How to Make your website Content Original that can Accept Google AdSense? Step 1: When you recieve this type of Email or any other issue type email from Google Adsense in which they can say that your website content is not looks like original then you can check first thing is that How much articles of the site is not original? So you can open this article by clicking on Edit button. Now you can Select your post content and Copy all content. After open this site link just paste your post content in this Box. So here is the result of the content you put in to this site for plagiarism check. Now if your article result is Unique like 92% then it means you can be eligible for Google AdSense Application Approval. If your Post result is going in to Plagiarism Like Above 80% Then its not a good sign for your website your website is not acceptable for Google AdSense. Note: Google AdSense Accept only those applications that can be Above 80% Unique Content on every post of the site. So you can check your website every post if your Google AdSense Application rejected. How to make Plagiarism type content Like Unique? If you find any post in to your website is not looks like unique so you can make these type of post like Unique just doing these steps. When you put your content in Urdu language box. It can give you the Result in English Language Box. Just copy English Box content and again paste it in to your blogger post if you want to verify it your post content is looks like original or not so you can again doing the process that i am telling in above paragraph. So you can all set. You can doing this step with your blog all type of posts is not looks like Unique and turned these post in to Unique Articles. I hope this Article Is really helpful for you. I you like this article so please share it with your friends on social media thanks.